I built this portable chicken coop for my grandson for his chickens. We had a coop built in the small barn we had, but kept finding chickens dead due to the fact that rats had made tunnels into the barn to get to the chickens food and the chickens. Thus came the portable chicken coop you see here. We moved the chicken coop around once per week and never did have any more problems with the nasty rodents. very nice job I have just finished mine. I like the rustic look. Join in and write your own page! It's easy to do. How? 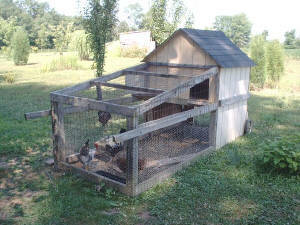 Simply click here to return to How To Build A Chicken Coop.